It's no stretch to say that people love heroes. Throughout history, human beings have sought heroes, written and told stories about heroes, and, at times, worshipped heroes. It's through this that we got Greek and Roman mythology, and many of our most famous legends. This trend continues through to today, but modern culture can often be misguided in choosing heroes, often celebrating individuals who may have done something to serve themselves, as opposed to serving mankind. (Way too many actors and athletes get labeled as heroes.) So, when a true hero comes along, not only should they be recognized and praised, but immortalized as well. Thus, we get movies like Sully. On January 15, 2009, a flight to Charlotte left LaGuardia Airport in New York City. For Captain Chesley "Sully" Sullenberger (Tom Hanks), who has been flying for 40 years, this was a very routine flight, along with his Co-Pilot Jeff Skiles (Aaron Eckhart). Just a few seconds into the flight, a flock of birds hit the plane, knocking out both engines. For only moments to react, Sully realizes that he can't get the plane to any local airport, so he landed in the Hudson River. Fortunately, everyone on board survived. However, this was just the beginning of the ordeal for Sully and Skiles. They are both immediately inundated with questions from the National Transportation Safety Board, who claim that Sully made a critical error in judgment and that he should have attempted a landing at an airport. As if this weren't bad enough, Sully can't escape the thought of the disaster which was averted. Will this man be vindicated? When the incident which would come to be known as the "Miracle on the Hudson" occurred, it was inescapable, as it dominated the news cycle, and "Sully" Sullenberger became an overnight sensation. The man appeared on talk shows, both serious and the late-night shows, and his name was inextricably to the event. However, most of the stories didn't go beneath the surface and other than the praise for Sully's actions, we didn't get much information on him and the aftermath of the situation. Sully moves beyond the headlines and shows us the pressure which Sullenberger (and Skiles) endures following the water landing. While the world was celebrating the fact that no one died, these two men were undergoing a litany of questions and accusations. The hearings with the NTSB immediately feel confrontational and it's clear that Sully and Skiles don't feel supported by the professionals around them. In addition, Sully is haunted by visions and dreams of planes crashing, while he's also dealing with the anxiety coming from his wife, Lorraine (Laura Linney). Director Clint Eastwood is no stranger to biopics (he's made about 10 at this point), and he certainly treats his subject with respect. As noted above, the movie does a good job of going beyond the headlines and showing what happened to Sullenberger following the event. However, the screenplay from Todd Komarnicki (based on a book by Sullenberger and Jeffrey Zaslow) jumps around too much for its own good. Instead of telling the story in a linear order, the movie opens with one of Sully's nightmares, then jumps to a hearing, and then shows us the actual crash. We are then treated to two flashbacks which show Sully's background in flying. I had thought that we would get more of these, exploring how he became a commercial pilot, but we just get the two. Then, in the third act, we see the accident again. While I truly admire the fact that the story took us behind the scenes and that it did it all in a relatively brief 96-minutes, I walked away with more questions than answers. I saw Sully in action, but I don't feel that I learned much about the man himself. Technically, the movie is fantastic, as they've done a great job of re-creating the crash, and Hanks truly inhabits the character, but I would have liked to have seen the movie truly go beneath the surface (unlike the plane). Sully won't be playing on a plane near you on 4K Ultra HD courtesy of Warner Home Video. The film has been letterboxed at 2.35:1 and the Disc contains a 2160p HD transfer. The image is incredibly sharp and clear, showing no discernible grain and no defects from the source materials. As we've discussed in the past, 4K UHD transfers look best with bright shots and this film features many daytime scenes, most notably the recreations of the incident. These scenes are almost blindingly crisp and clear, showing an amazing amount of detail and a sharpness which made me feel as if I could step into the image. The colors look very good and the image is never overly dark or bright. The depth is also impressive, giving a qausi-3D look at times. The Disc carries a Dolby Atmos 7.1 track which provides clear dialogue and sound effects. This is an incredibly powerful track which drives home the important sounds in the film. We are placed in the middle of the water landing, as the front and rear channels are filled with the sounds of the plane and the river. The subwoofer is constantly active with the roar of the plane. This dominant track matches perfectly with the clarity of the video. 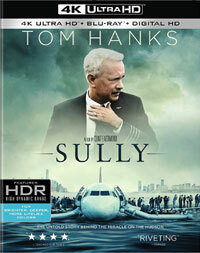 The Sully set also includes a Blu-ray Disc which contains the three extra features. "Moment by Moment: Averting Disaster on the Hudson" (16 minutes) is a brief documentary which includes comments from the real Sullenberger, Skiles, and air traffic controller Patrick Harten, as they recount the entire incident. These interviews are combined with clips from the movie, so we don't get any footage of the actual incident. "Sully Sullenberger: The Man Behind the Miracle" (20 minutes) is another documentary, this one exploring the life of Sullenberger. It includes more of the interviews which we saw in the previous piece, along with comments from the real Lorraine. We also see photos from his life. "Neck Deep in the Hudson: Shooting Sully" (20 minutes) is a making-of featurette where we learn that Harrison Ford was responsible for setting the project into motion. From there, we get comments from Hanks and the creative team, and behind-the-scenes footage which examines the production.